Since I’m not generally a fan of sugary-buttery goodness, you can probably guess that I wasn’t the one who’d ordered this. I wasn’t tempted to try it and didn’t eat any of it either. 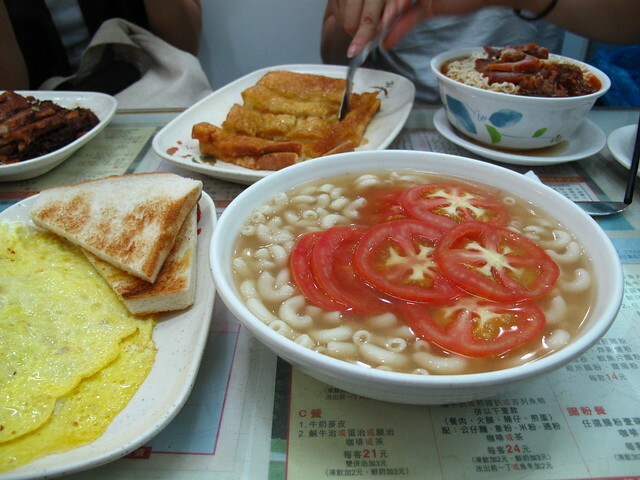 Instead I ordered tomato macaroni soup for the first time, apparently a cha chaan teng staple. It was just okay, probably something I would order if I was ill or if I didn’t feel like eating at all. Yay for roasted meats. The pork crackling was very good and so was the side of crunchy cabbage. I only wish they had included Singapore-style chicken rice or duck rice chilli in their selection of condiments. This was our late dinner last night. I got home slightly earlier i.e. 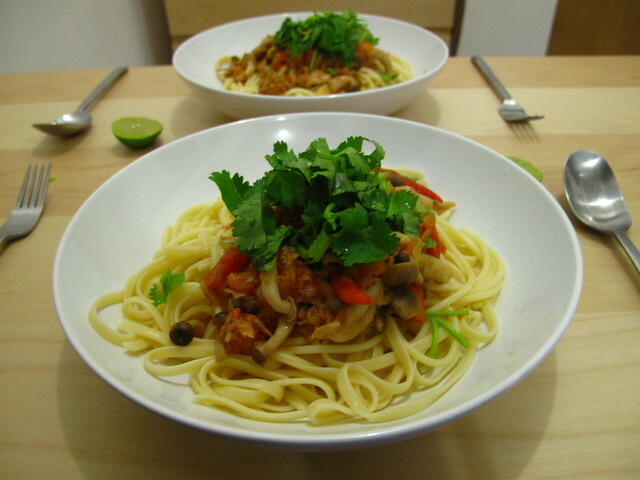 8.30pm and whipped up a quick meal of chilli tuna linguine. Canned chilli tuna courtesy of my friend S who unloaded her stash at my place en route back to Singapore. As you can see, I love coriander very, very much and usually add an irrationally ginormous amount to my food whenever I cook at home. tomato macaroni soup looks strange~ any taste? Tasted just like how it looks, bland-ish. haha- I think I know who S is. chili tuna has followed for years. Ur linguine looks quite beautifully al dente! cranberrymist – Haha thanks. Hmm I need to lay my hands on more chilli tuna ! Yeah, I’m not a big fan of the macaroni in plain soup with tomatoes either. 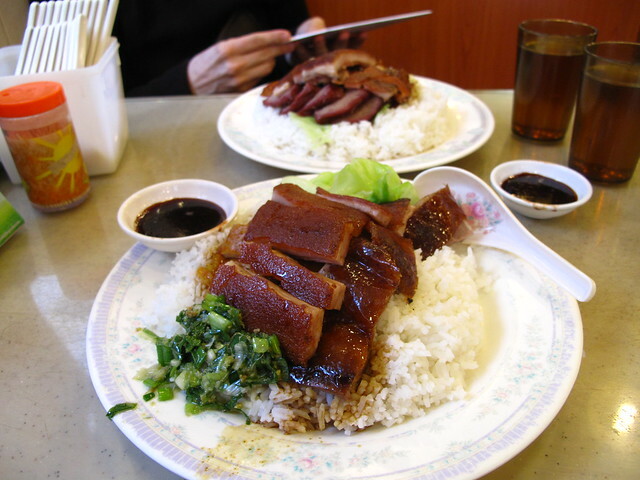 I think you need to grow up in Hong Kong to really like that – one of those WW2/Post War nostalgic dishes. I don’t get why everyone orders it at Australian Dairy Company. 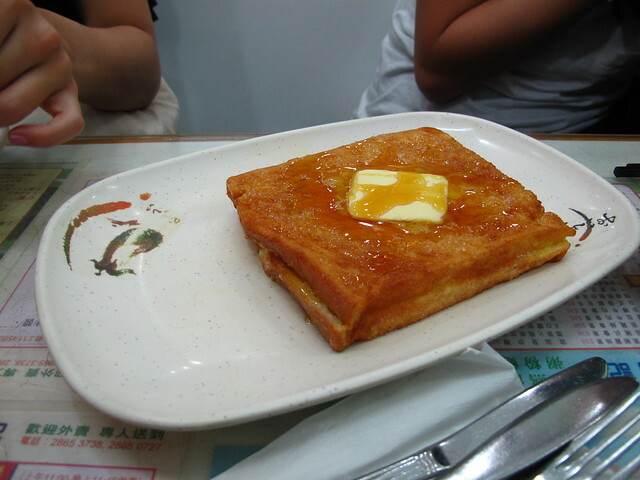 I do love HK style french toast, there’s a little bit of savory thrown in there as well, as it’s got peanut butter between the two slices of bread. You’re right – it is awfully sweet. Which cha chaan tang is this one? Terence – Haha, good that I didn’t try the toast then. I just don’t get the tomatoes part of the macaroni soup. They are not overcooked and are way too fresh/raw for my liking. Macaroni soup on its own is something else altogether. Yum !